Auckland, renowned as the City of Sails, is a perfect spot in New Zealand that offers ‘one-of-a-kind’ memorable experiences to visitors. This is the country’s largest city which is home to breath-taking hiking trails, secluded beaches and lush native forests. 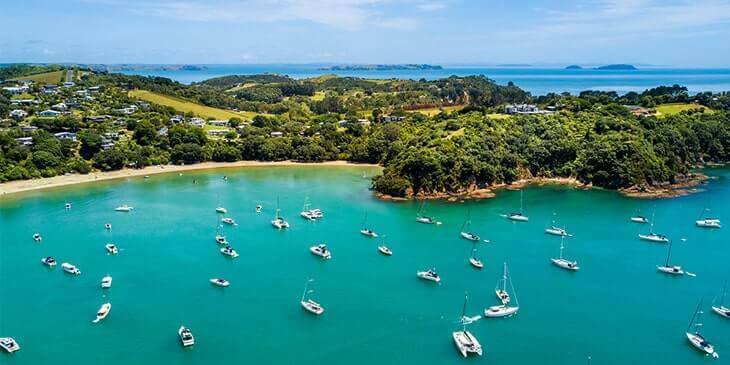 Visit one of Matakana’s vineyards for wine tasting, enjoy musical events and dance performances at the Q Theatre, visit the Auckland Art Gallery to witness some of the world’s best traditional and modern artworks or stroll around Dominion Road to sample a delicious range of local desserts. One thing is sure - this vibrant city of world-class restaurants, trendy bars, dazzling nightclubs and sophisticated art galleries will lure you to explore more. Auckland boasts a plethora of exciting adventure activities… Go horse riding at Muriwai Beach, canyoning in the Piha Canyon, hiking to the top of Mount Victoria for 360-degree views of scenic landscapes, visiting the indoor Snowplanet snow centre to experience skiing, snowboarding and tobogganing, taking a 360 degree skywalk around the outside ring of the Sky Tower, zip lining through the trees in Waiheke Island or bungee jumping from the Auckland Harbour Bridge. You can also go snorkelling and diving at the Goat Island Marine Reserve which makes for an amazing experience. Book cheap flights to Auckland through Brightsun Travel and enjoy many thrilling adventures here. Auckland is an ideal hotspot for shopping fanatics. Dress-Smart in Onehunga is New Zealand's largest outlet shopping destination where you can browse a range of world-class products, from footwear to fashion items and handbags. Visit the hip Ponsonby strip which is packed with boutique fashion stores selling top quality jewellery, upmarket homewares and accessories. Wander through the city’s New Market and pick up designer apparel from some of the country’s top fashion names, including Zambesi, Karen Walker and Kate Sylvester. You can also buy exquisite handmade jewellery, ceramics, and antiques from the stores and boutiques of Parnell village. Brightsun Travel offers a range of cheap air tickets to Auckland, so why not see what this wonderful city has to offer for yourself.